Click here to receive a free copy of the coaches guide for using A3 thinking for personal development that was developed for the Lean Coaching Summit. Now that your learner has developed their problem or opportunity for improvement towards becoming a better leader or coach of others, and has uncovered some of the root causes of their behavior, they are ready to move to the “right side” of their A3. Typically the process to develop the “right side” plan is easier to move through that the heavy lifting thinking that goes into “left side” process of identifying current behaviors, focusing on one area on which to work, and uncovering the reasons for limiting habits. As you guide your learner to the “right side” of the A3, your role as coach now moves supporting the process of practice, reflection and ongoing learning. As a coach, help you learner determine a few specific actions that they will take in service towards getting a little bit better every day towards their goals identified on the left side. The learner should be specific about the new action or habit they want to practice and in what circumstances. When I hear myself say “I think”, use this as a cue to stop, pause and think of an open-ened question of inquiry to ask instead. When I find myself with the urge to jump in with my opinion after asking someone a question, stop and count to 10 first before saying something to give them space to think. Help your learner define what, when and how will they conduct their experiments for improvement. This should include identifying a process and a plan for putting the experiments into action and to assessing how the experiments are progressing. I have found that helping your learner develop a plan to set daily intention for their practice that day and reflection on how they performed to plan is a powerful enabler to learning and new habit creation. This can be as simple as taking 30 seconds going into a stand-up meeting to set the intention that “in this meeting I will focus on asking questions of inquiry” and at the end of the meeting either asking participants a process question such as “what was the most helpful question that I asked today?”, doing a personal self-assessment, or having a coach provide feedback (or all of the above!). What role does the coach play? The creation of the plan is also an opportunity for you as the coach to talk with your learner about how you can help support them in their new habits. 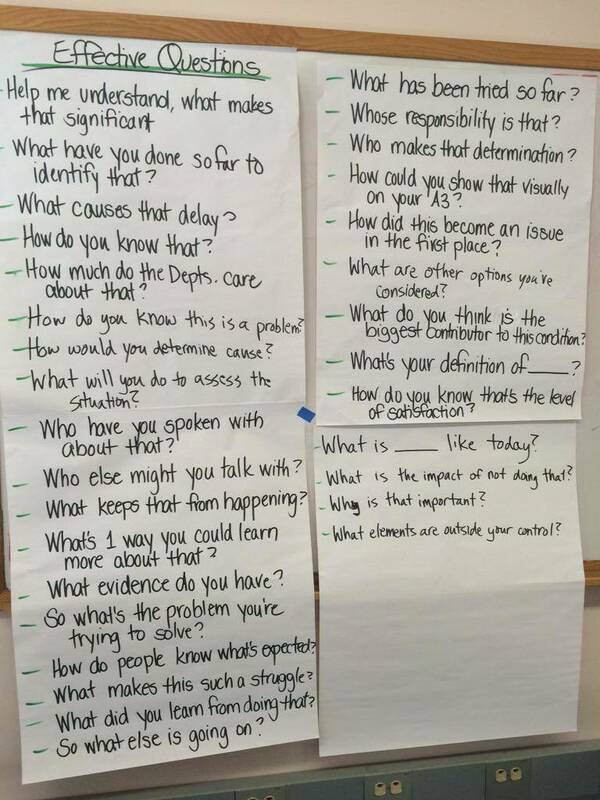 How can you observe them and provide feedback? How can you support their learning process? Your learner should specifically state who they will engage in their process, how they will reflect and continue to learn. 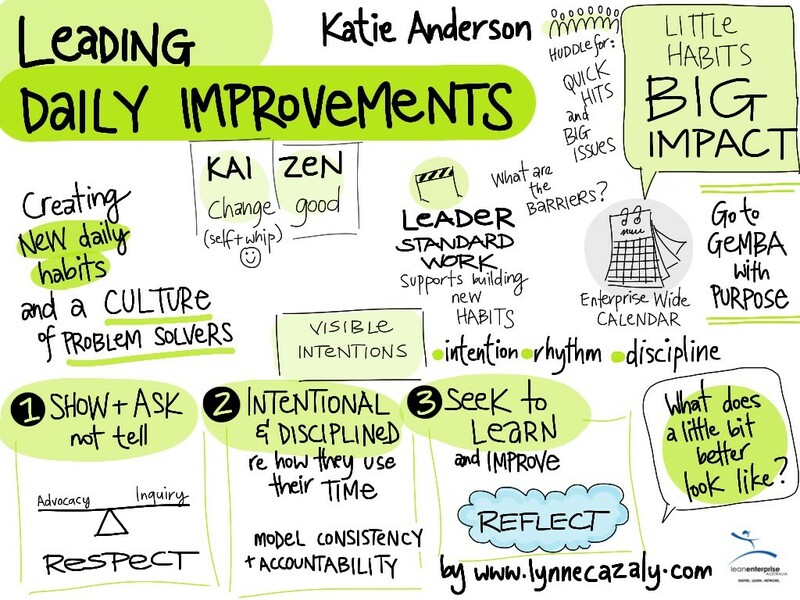 As a coach you can help your learner deeper their skills of reflection go through iterative learning cycles. 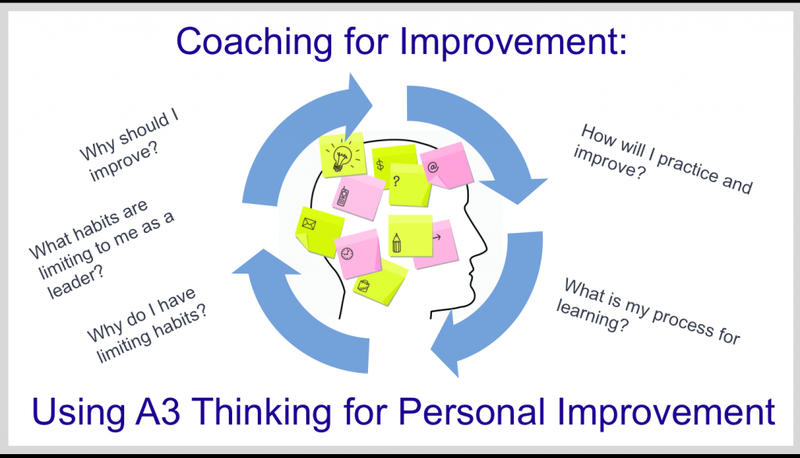 Remember that like any A3 thinking process, the development of the personal improvement A3 is iterative and requires “going to see” (go to “gemba”) to be able to provide observable feedback to your learner throughout the process of creating new habits. 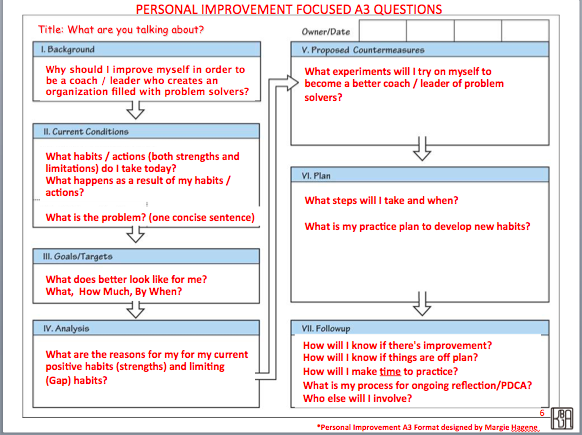 The development of the personal improvement A3 is just one part of the Plan-Do-Study-Adjust cycle. Plan and Do is important, but the process Study and Adjust is where new we continue to improve and develop stronger habits. Come join me for one day of deeper learning at the Lean Transformation Summit in March 2017. I will be leading a one-day pre-Summit workshop titled “Coaching for Development: Structured Coaching Using A3 Thinking”. Have you tried using this process on yourself or someone that you are responsible for developing? What has your experience been? I welcome your questions and comments about this process in the comments section below.